The Lantern reviews the speech team's season so far. Sophomore, Ryan Schlichting, participates in warm ups with the team before a speech tournament. 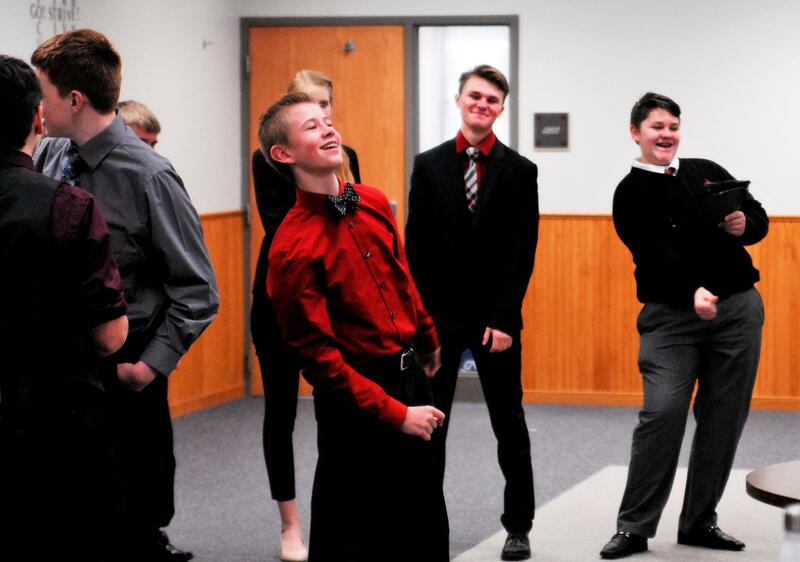 After months preparation, the Cannon Falls speech team finally participated in their first tournament of the season, which was held in Cannon Falls on Saturday, February 3rd. For some, this tournament represented the first time competing in a new category. For others it was their first time competing in general; however, a majority of the team was made up of returning veterans who were ready to dominate the competition. There were a number individuals who took home first place ribbons including Zoe Jesh (Extemp Reading), Samuel Coyle (Novice Storytelling), Tristan Qualey (Novice Poetry), Grant Schlichting (Extemp Speaking) and Bryson Felton (Storytelling). Most recently, the team competed at the St. Anthony “You Lucky Dog” tournament. This is a big one for the speech participants as instead of trophies and medals, St. Anthony gives out little stuffed dogs. Sadly, the team did not have any event champions, but they had a mess of second place wins including those of Zoe Jesh (Extemp reading), Ryan Schlichting (Extemporaneous speaking), Molly Bowen (Great Speeches), Hannah Singewald (Poetry), and Bryson Felton (Storytelling). Overall, the team took home a third place win at the tournament and a slightly larger dog than those given out as individual awards. For the team that is used to taking home first, the third place award seemed to be a bit of a setback, however, the school missed second place by a mere two points. Despite the setbacks given by the new ranking system, many on the team are hoping that their seasons will get better. “Once we get through the early bumps, the season will (hopefully) get much better for not just me, but everyone involved,” stated Parks. “Right now I just need to push through all the frustration, then I know I’ll be set.” There is an overall sense of optimism that surrounds the team and its members, many of who are ready to crush their competition whenever they get the chance. Being the 2017 State Champs has put a lot of pressure on the team to perform well; however, the outstanding coaches and work ethic of the students should make the task much easier. So far the team is having a perfect season and they hope to continue that trend in Farmington. On a final note, Zoe Jesh offered a piece of advice for the new members: embrace the wall.